Microsoft Windows 10 and Microsoft Windows Server 2016 no longer include the Hyper-V Integration Services ISO, vmguest.iso. The rationale behind this change is that the latest supported Windows and Linux operating systems provide their own Hyper-V integration. 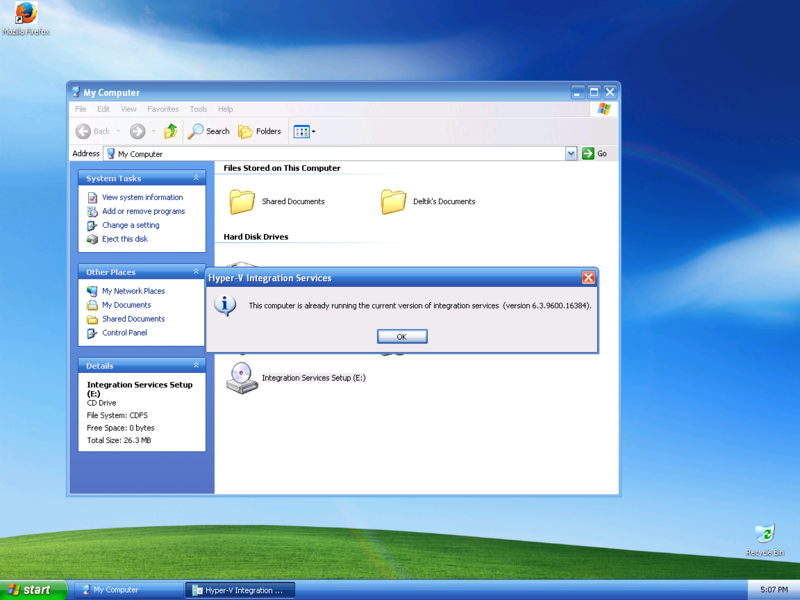 This means that there is no built-in way to install Hyper-V Integration Services into legacy operating systems such as Windows XP (Windows Embedded POSReady 2009). Fortunately, Deltik is mirroring the Hyper-V Integration Services 6.3.9300.16384 ISO, which came from Windows 8.1 / Windows Server 2012 R2. You can download this file and mount it as a CD in your legacy Hyper-V guest to install Hyper-V Integration Services. Any changes to the rules will be noted by a staff member and posted on the Deltik home page. Hey everyone, I was just posting a news article because i can.Â That's because ZAPPERPOST has hired me as the president of Deltik. I know what you're thinking isn't Deltaburnt the president.Â The answer to that is yes but he is a higher status going into WYCTO, but I am in Deltik only. I've decied to take up C# so I can code an online 2D engine for a game I'm making with some other people. If you know any sites I can get video tutorials that would be great, thanks. Also if you need help programming C# in the future, give me a call. If you go to WYCTO! right now, everything has changed. I converted it to SMF. I decided to switch because I was convinced by das7002. I will be developing on the new WYCTO!, so stay calm, as users and stuff are all over the place. It isn't nice and integrated like phpBB was, so I hope to find an integration method. PLEASE READ THE RULES UNDER WYCTO! AND USER SETTINGS, BECAUSE THEY HAVE CHANGED. Please use the WYCTO link provided by the navigation bar on Deltik so that everything is functional. Darkness Begins Episode 1 Almost Ready! A button for the site is also at the top. EDIT: Ask Zapperpost for proof, he saw that I already had tons of stuff ready. But I only gave him like a 4 second sneak peak. I am currently learning C++, which is a very hard coding language. I am currently doing the basics which are console programs (the black boxes that have text in them). After I learn C++ I will go onto an easier language based off of C++ which is C#, then I will learn visual basic which is also based off C++, but Visual Basic is a nifty coding language that lets me make really cool stuff. "Now why start with C++, why not start with something easier." says the curious reader. The answer is because almost every coding language is based off of C++ which means they are all like C++, so if I start with C++ I wll already know part of all those coding languages because they're made from C++! But console's are easy, I'm going to have trouble when I get to graphical stuff. Welcome to Deltik. We hope you enjoy it here. Recently, Deltik was just reset. If you are already an existing user, you have been deleted. You must recreate your account. The Deltik admins will do their best to restore Deltik to its original condition. We are so sorry for the inconvienence!